Apple on Wednesday released a major update to GarageBand for iOS, the company’s app for digital audio creation. GarageBand 2.3 features a new way to download sound packs, new drum sounds, and new Asian touch instruments. The GarageBand 2,3 update is available for free in the App Store. 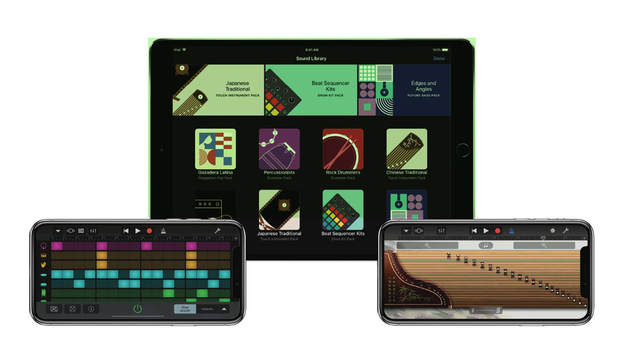 If you already have GarageBand on your iPad or iPhone, look for an app update. Apple offers a wide variety of instruments, loops, and sound packs, but the drawback is that the more you add, the more storage space the app requires. And on an iPad or iPhone, storage space and at a premium. Apple new Sound Library helps alleviate the GarageBand storage demands. You can go to the Sound Library directly in GarageBand, peruse its contents, and download anything you want to use for free. Then when you’re done using a sound pack, you can delete it from your app and free up storage space. Need that sound pack again? No problem, just go to the Sound Library and download it again, for free. Electronic dance music and hip-hop artists are going to love GarageBand’s new Beat Sequencer. Inspired by programmable drum machine hardware like the Roland TR-808, the Beat Sequencer shows the individual instruments in a drum kit, and then you can program a pattern for each one. You can also load a preset pattern and modify it, or you can tell GarageBand to create a random pattern that you can tweak. Patterns can be saved for future use. GarageBand 23 also include three new Drummers: Pop, Songwriter, and Latin. Musicians are always look for new sounds and unique ways to use those sounds. With that in mind, GarageBand brings three Asian instruments to the forefront: the koto and the guzheng (both plucked string instruments), and taiko drums. 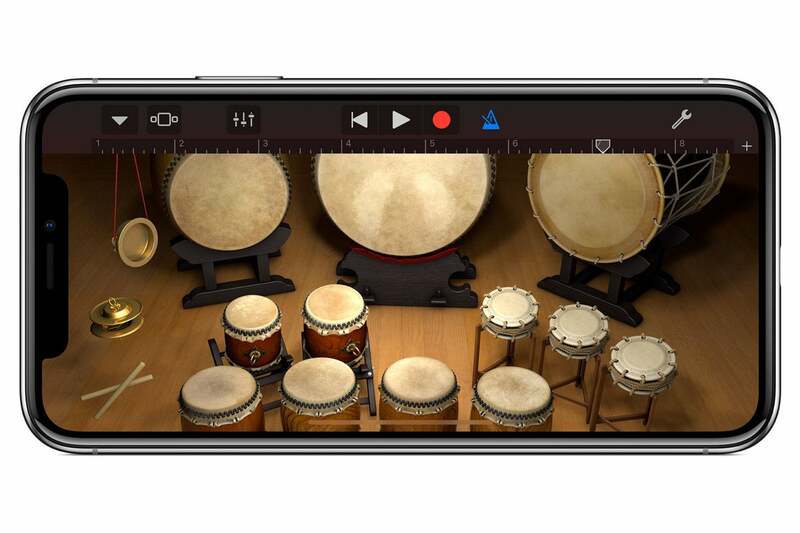 Taiko drums on the iPhone X. The new GarageBand 2.3 is optimized for the iPhone X display. The koto and guzheng are set be default to play traditional pentatonic scales. You can customize the instrument’s scale, however, by tapping on the Scale button and picking a scale. To play the taiko drums, you tap the center of the drum for a hit. Tap the edge of the drum for a rim hit. To create a muted hit, hold one finger on the drum and then tap it with another finger. Touch and hold the drum with two fingers to play repeating notes, and spread your two fingers apart to speed it up.